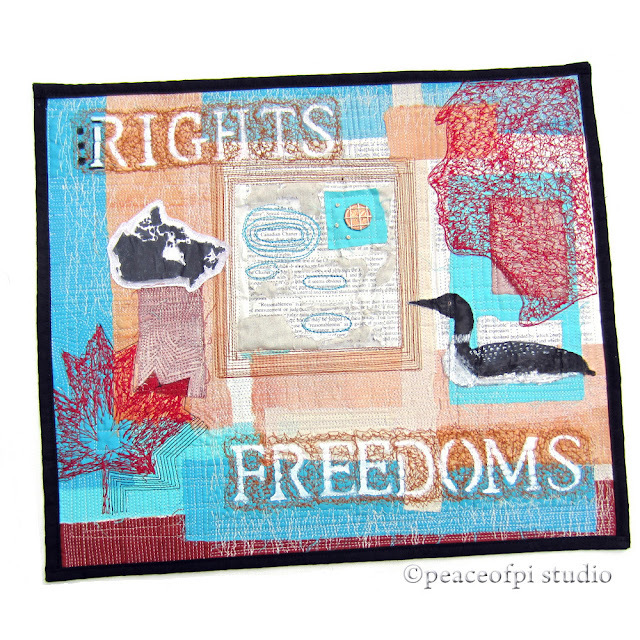 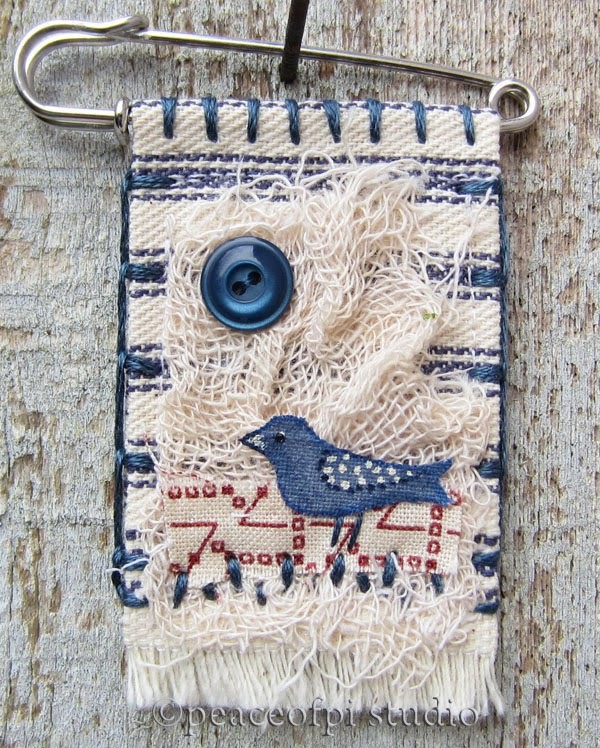 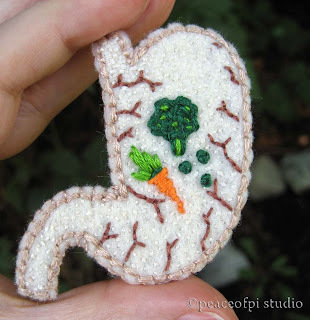 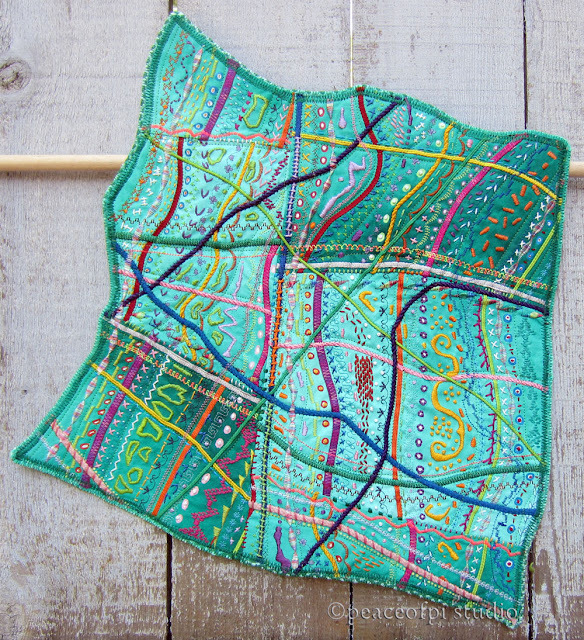 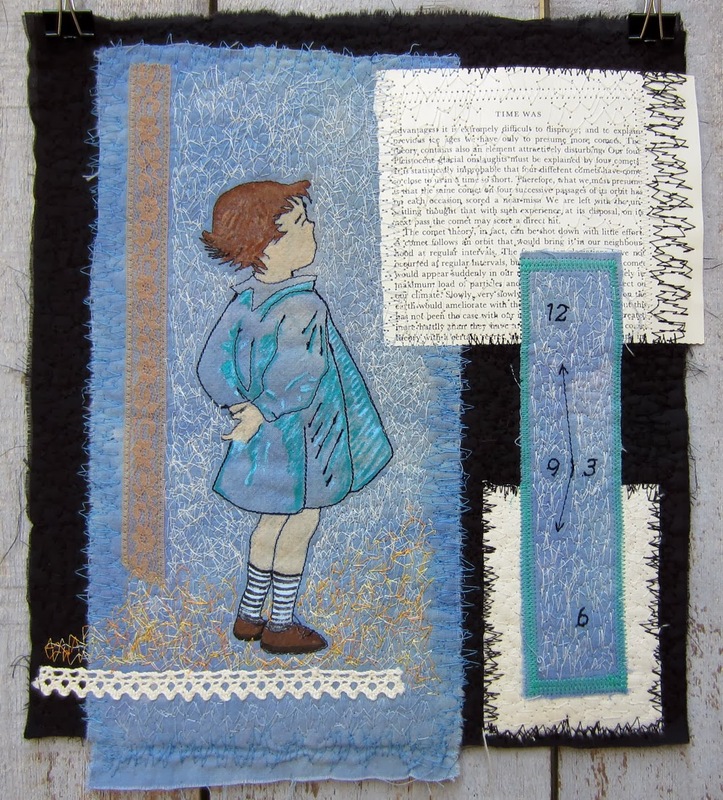 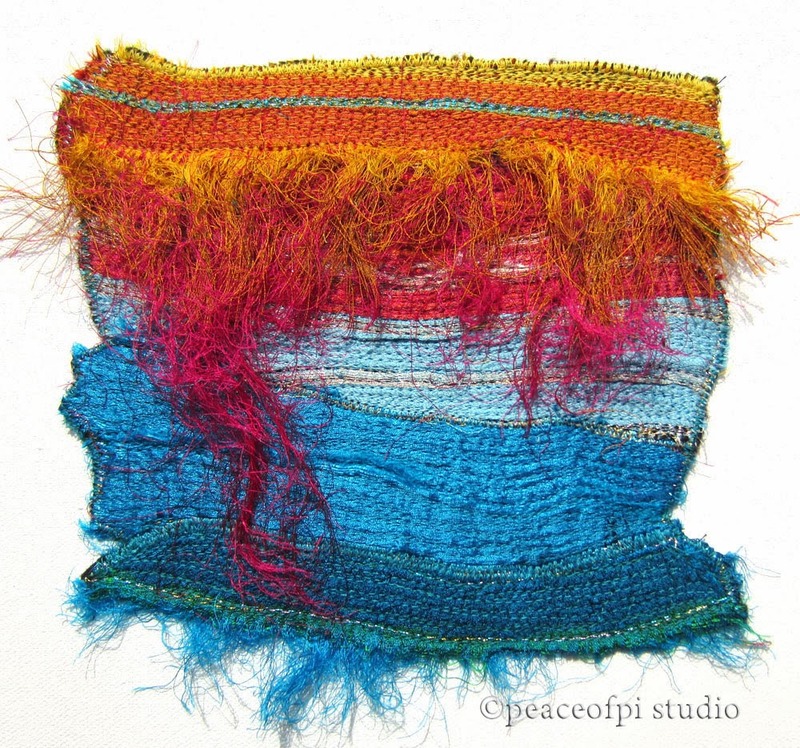 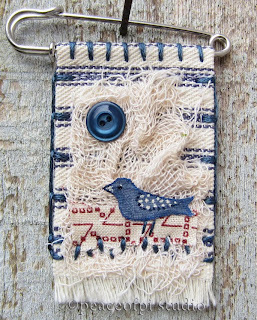 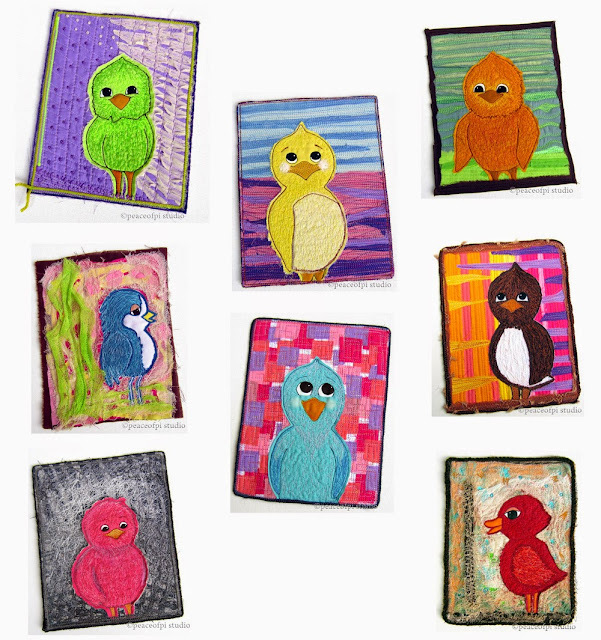 Jo's fiber art and stitched collage is freeform & improvisational, created using hand and machine stitching, needle felting, beading, crochet and studio dyed fabrics. 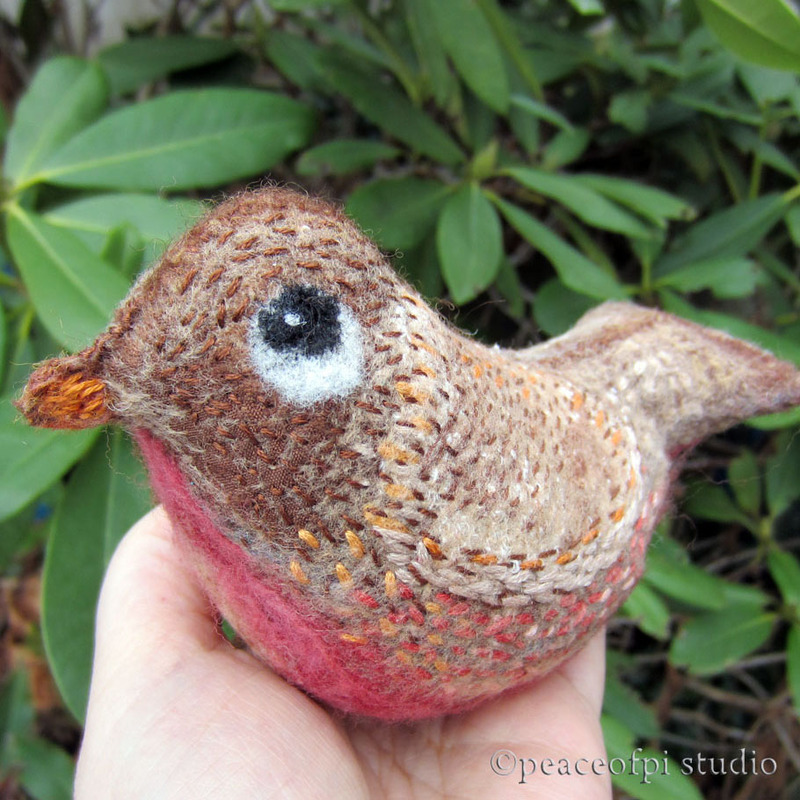 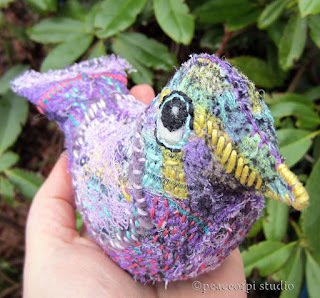 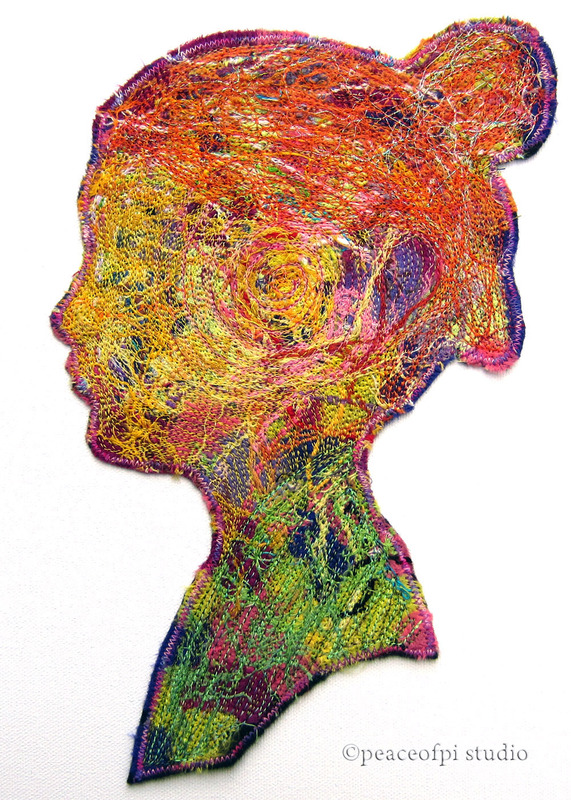 Her one of kind Fiber Art pieces and Soft Sculptures combine art and fine craft. Jo is a contributing Artist for the book 350 Quilting Tips, Techniques and Trade Secrets and is a member of TAFA the international Textile and Fiber Art association. 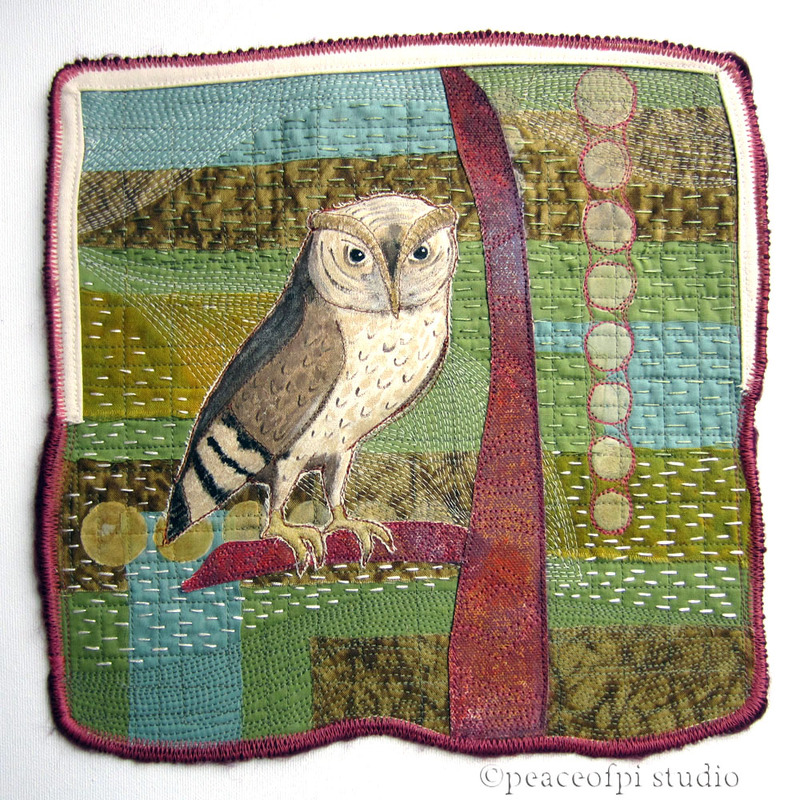 Vista Quilt, Hand Embroidery & Needle Felting (As seen in Art Quilting Studio magazine, Volume 5, Issue 2). 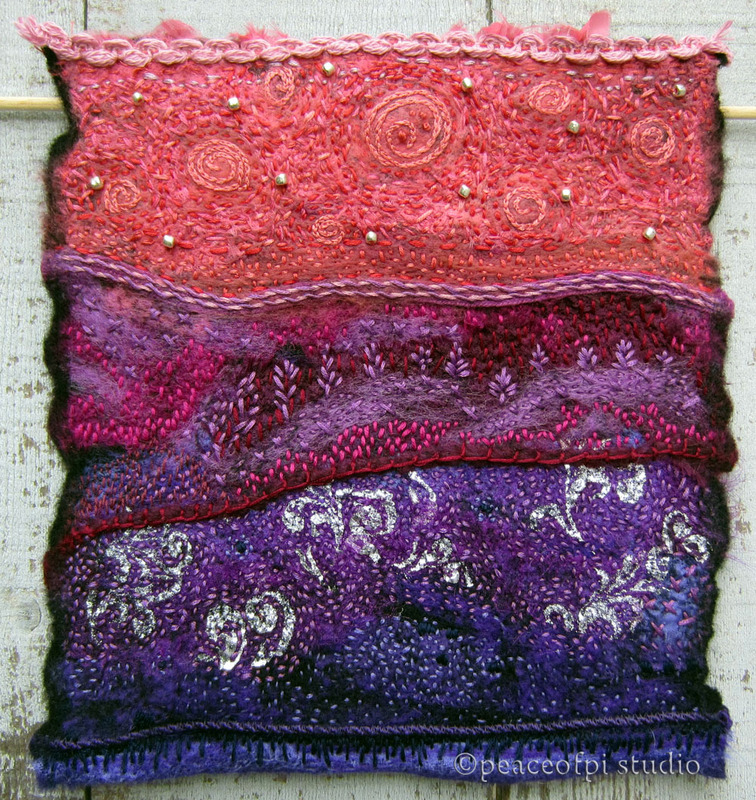 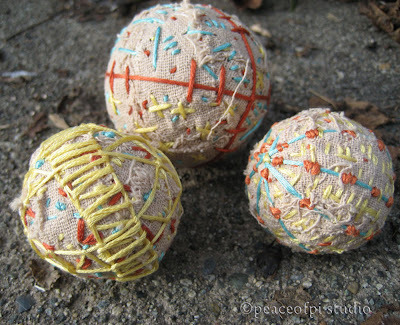 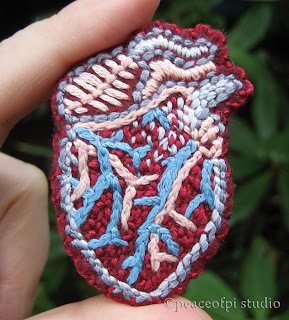 Fiber Art work strives to be informal. 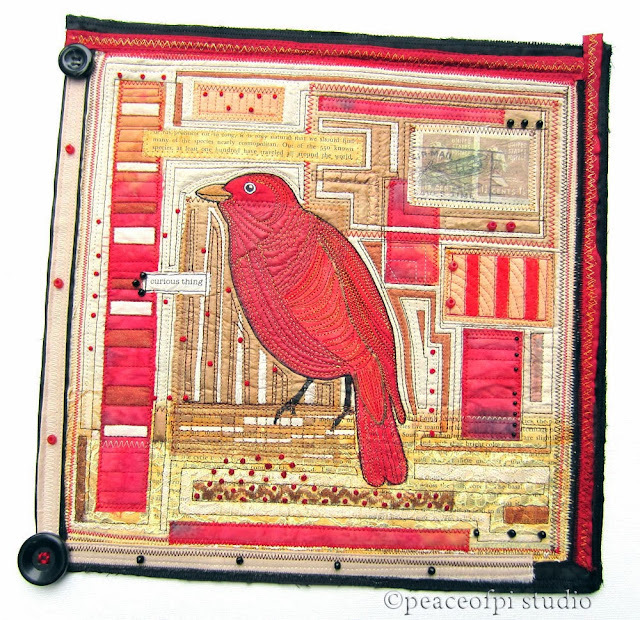 Age, distress and a timeworn aesthetic are core motifs, with peace, inner calm and authenticity as central themes. 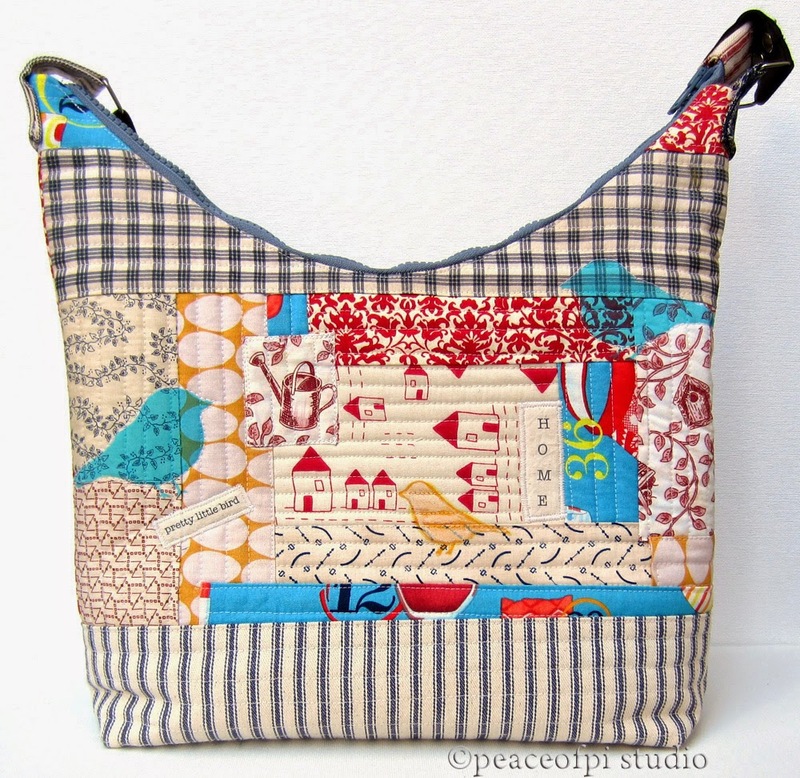 Woman with an updo, part of the Profiles Series (featured in Art Quilting Studio magazine, V.6, Issue 1) Some fiber art and quilt-y work turns to the functional and purses, pouches and bags are the result. 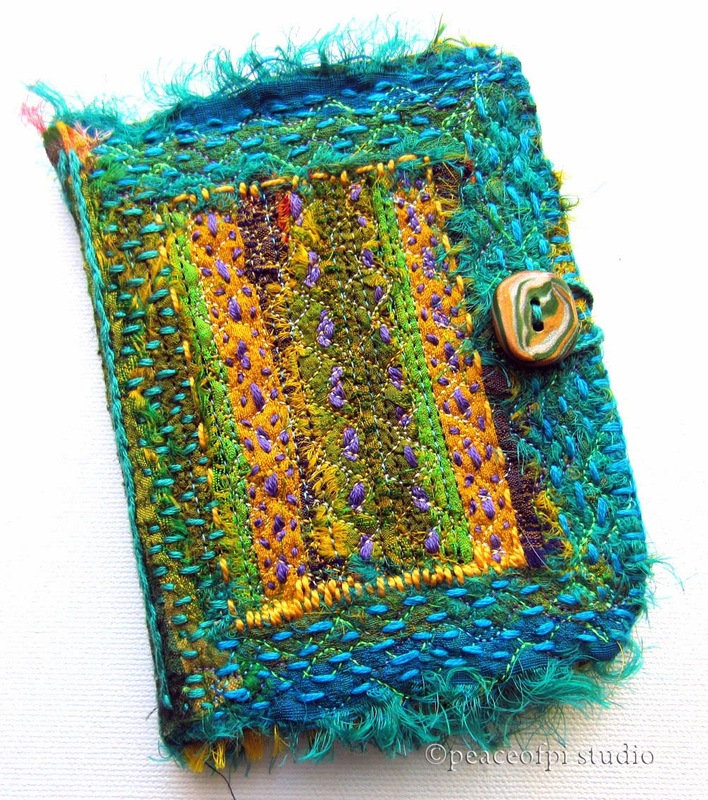 Cover, Silk Book, Needle Felting and hand embroidery. 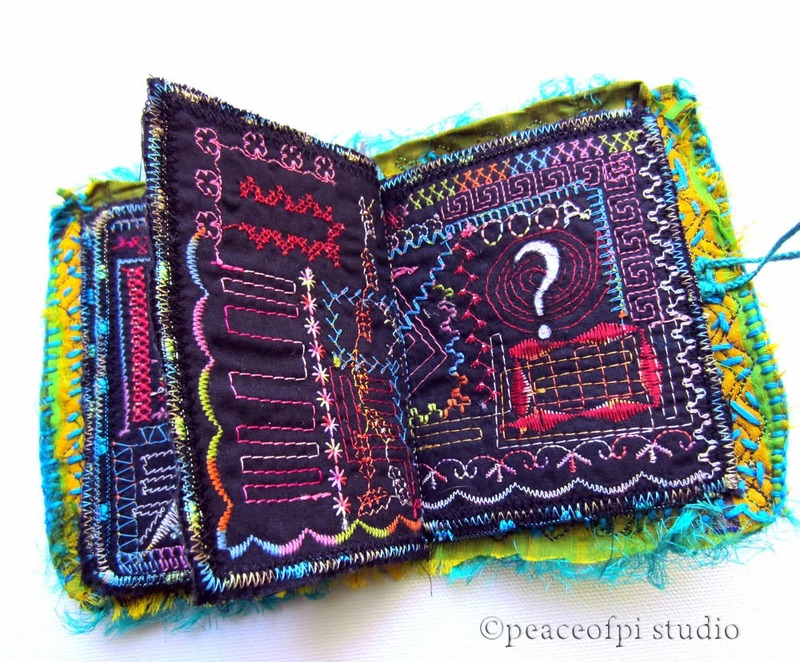 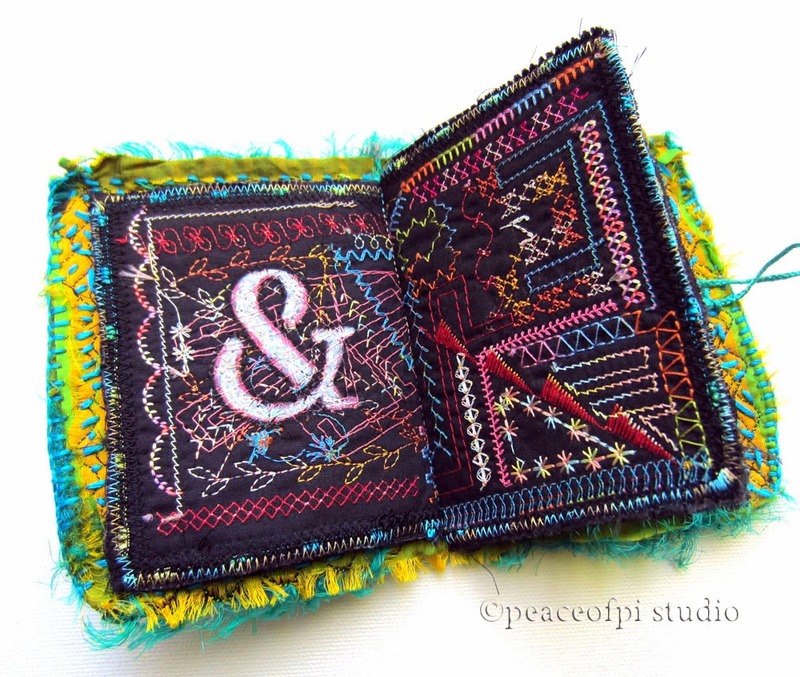 Silk Book, inside pages, machine doodle stitching. 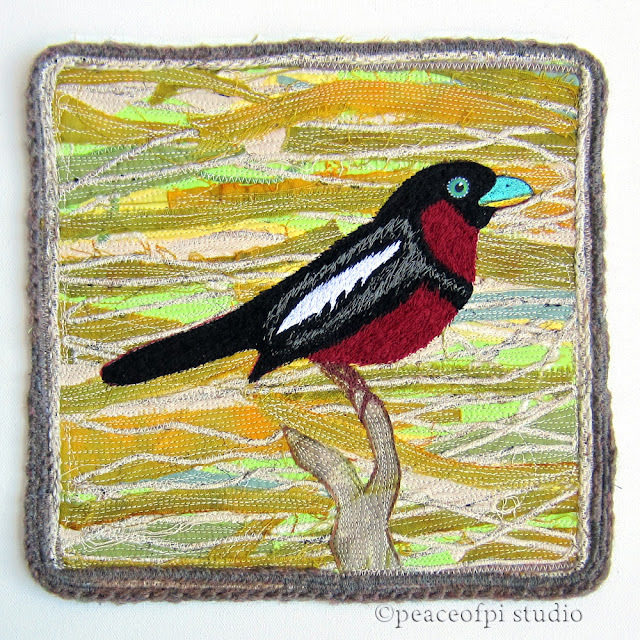 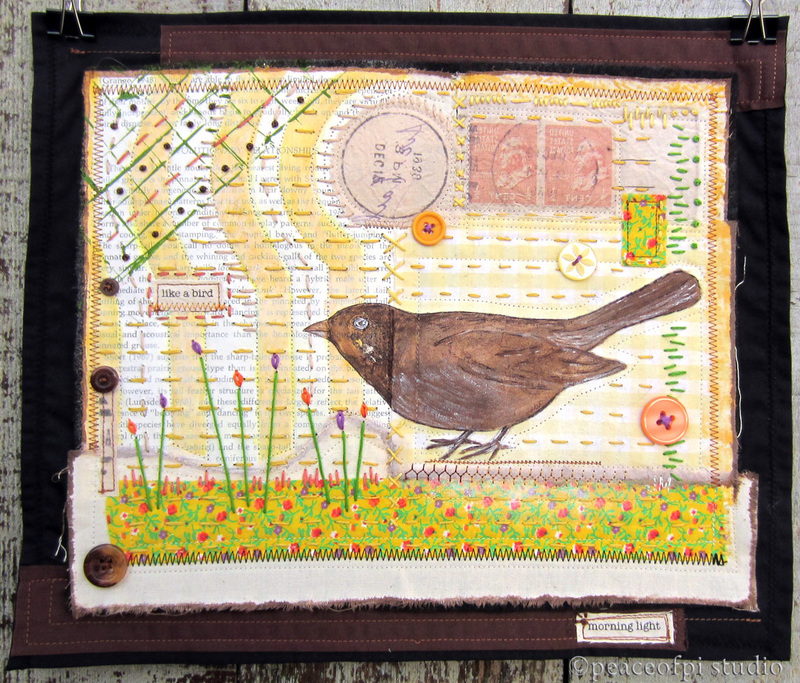 Grosbeak Stitched Collage, Fabric, paint, hand & machine stitching. 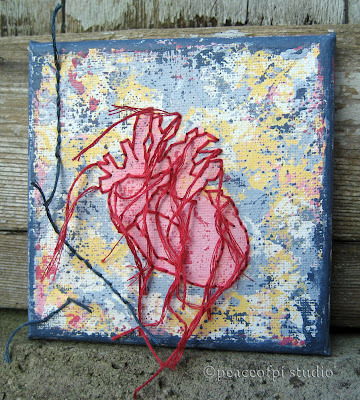 Stitched Heart Acrylic and stitch on wrapped canvas. 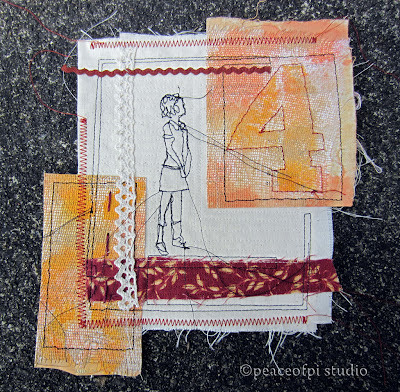 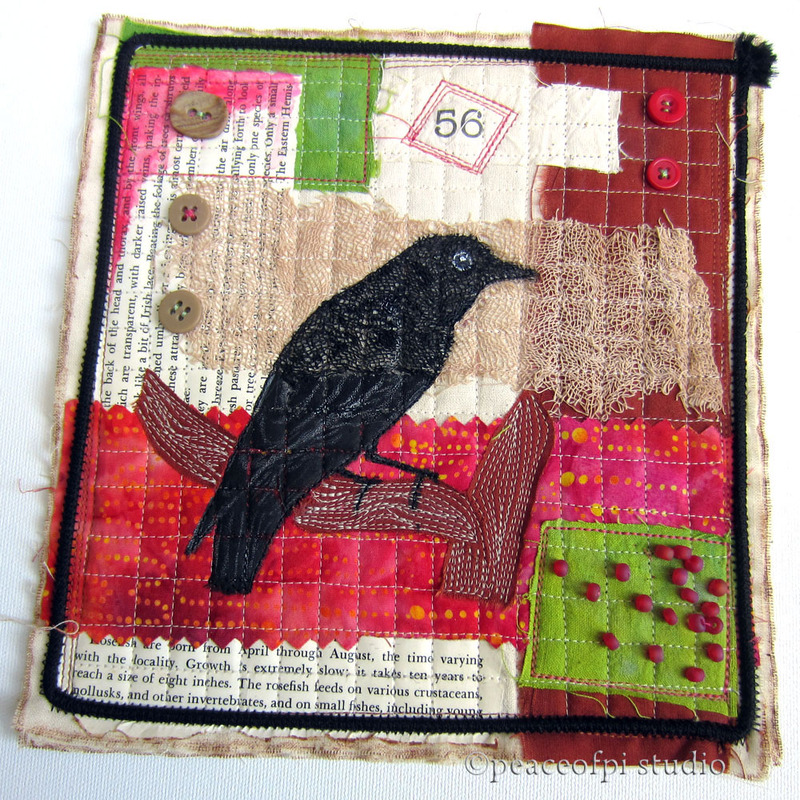 In the Crow's Nest Mixed Media Art Quilt. 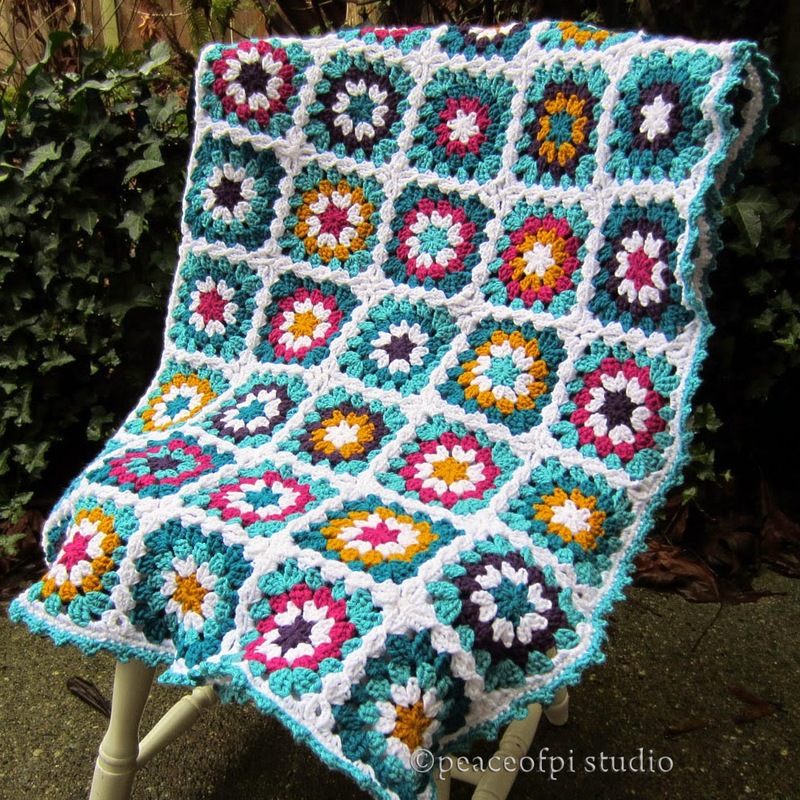 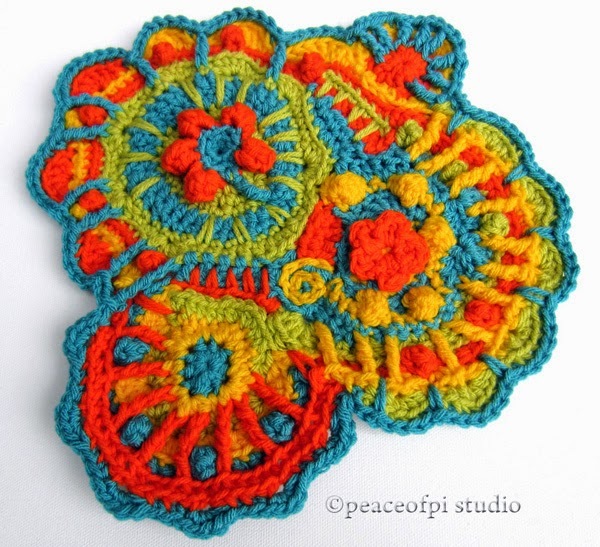 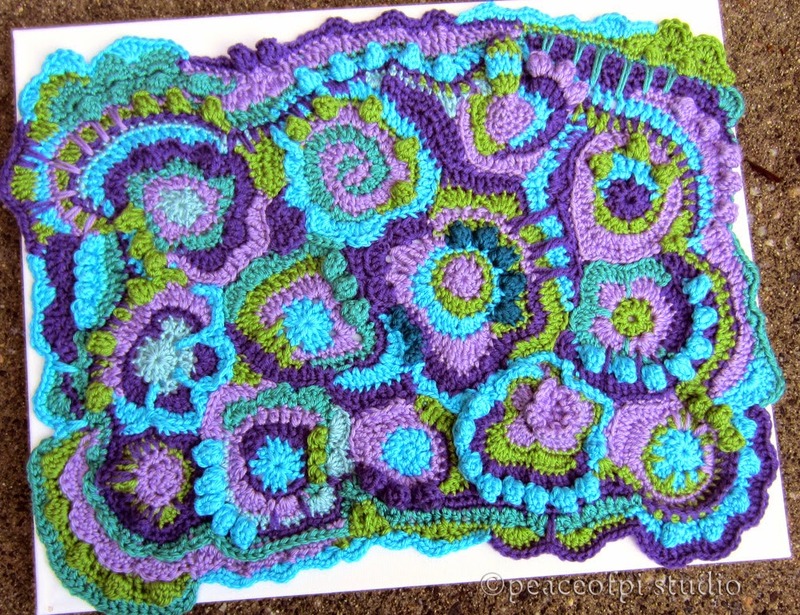 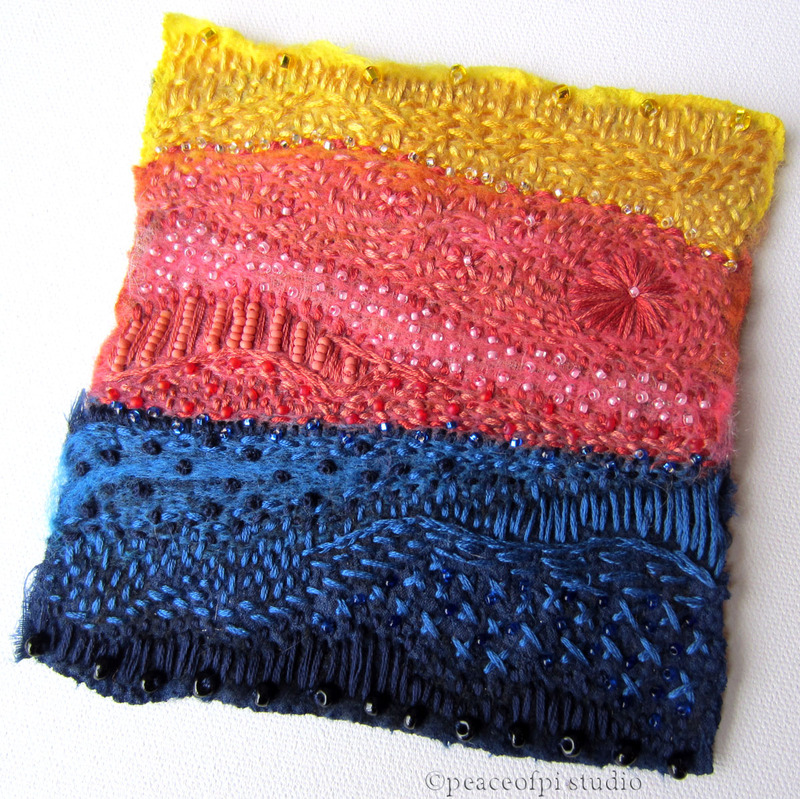 Crochet work is freeform and colorful. Pieces include wall art, installations and functional items. 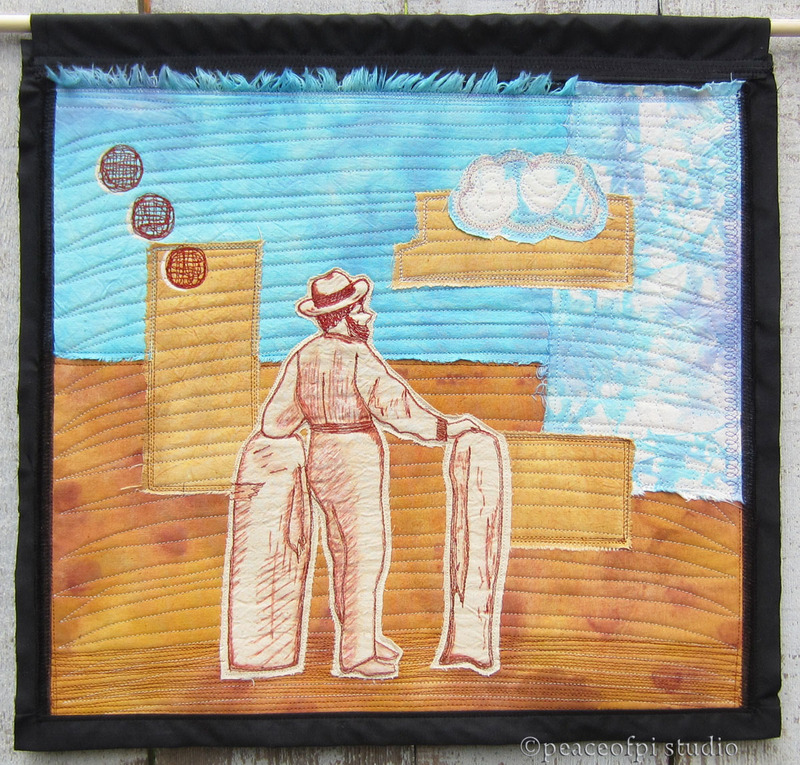 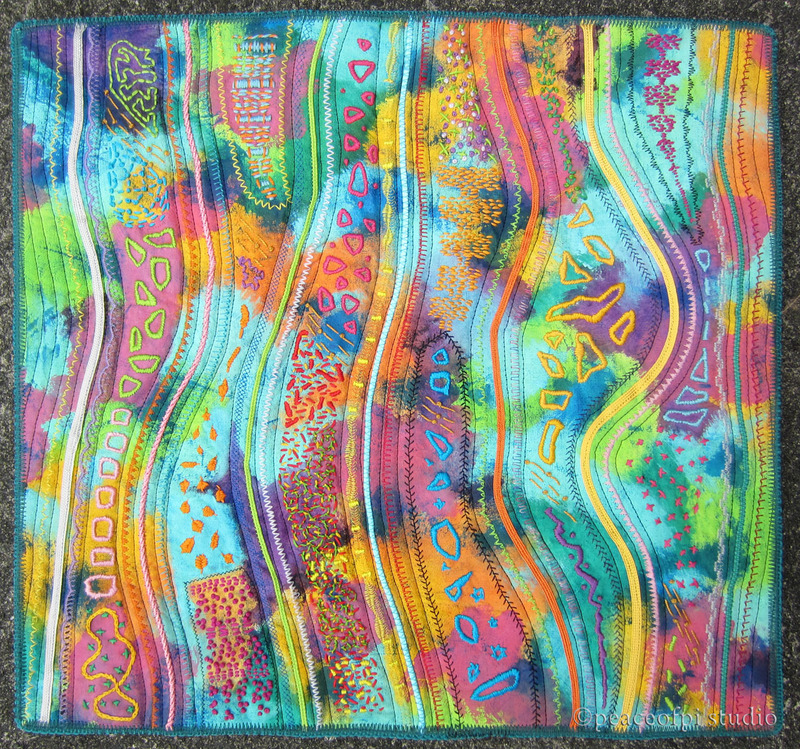 Art quilts are both abstract and pictorial. Exuberance Art Quilt Hand Embroidery & Machine Stitch on painted fabric. 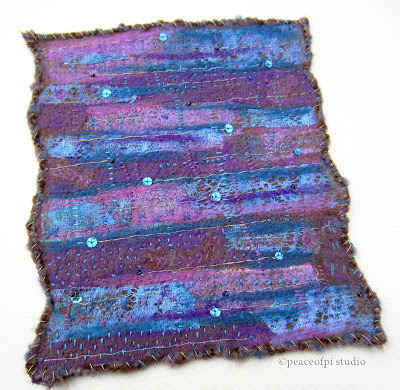 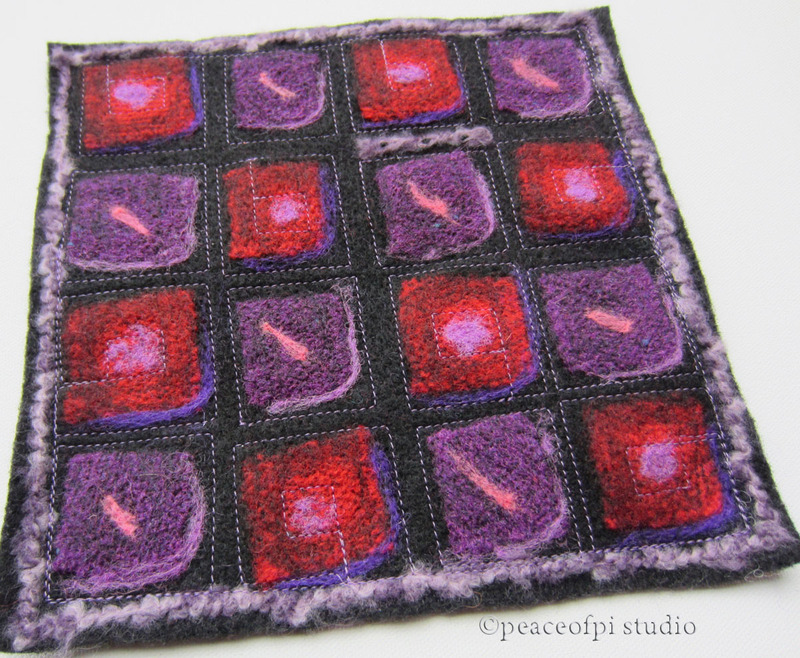 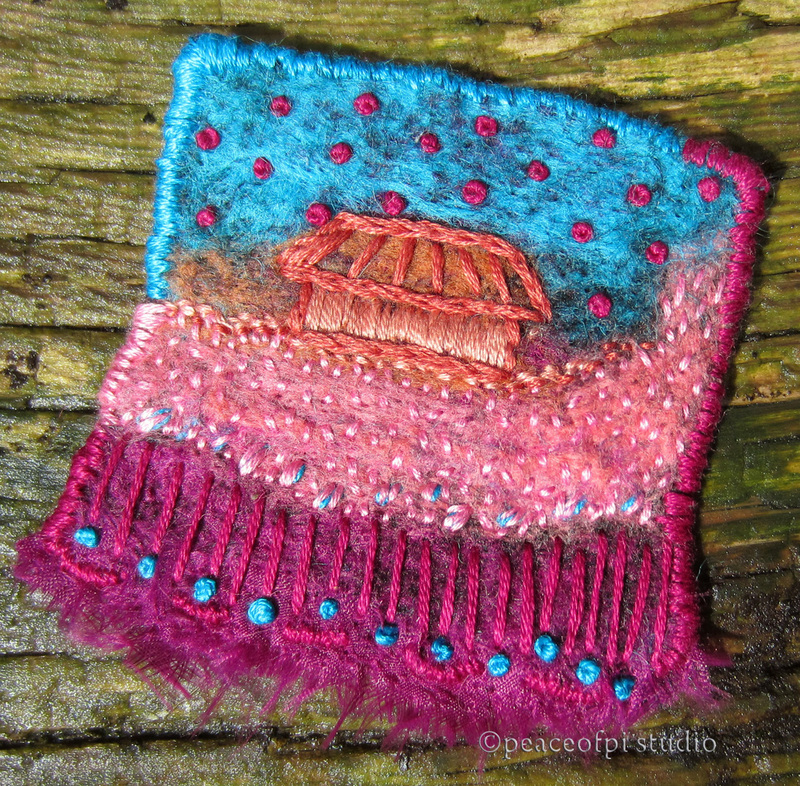 Violet Light, Hand Embroidery on Needle Felted mixed fibers (As seen in Art Quilting Studio magazine, Volume 5, issue 2). 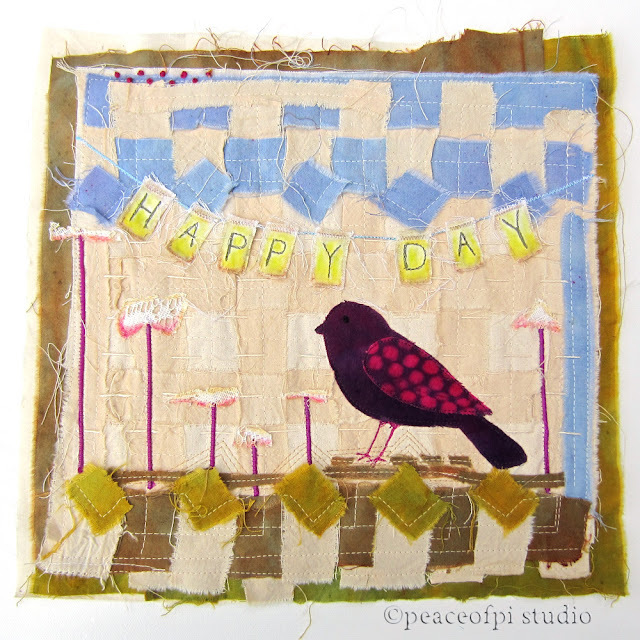 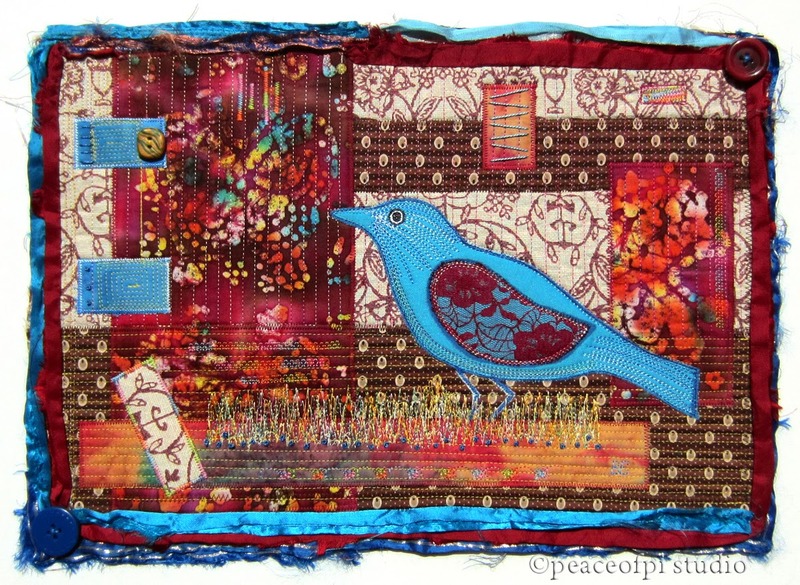 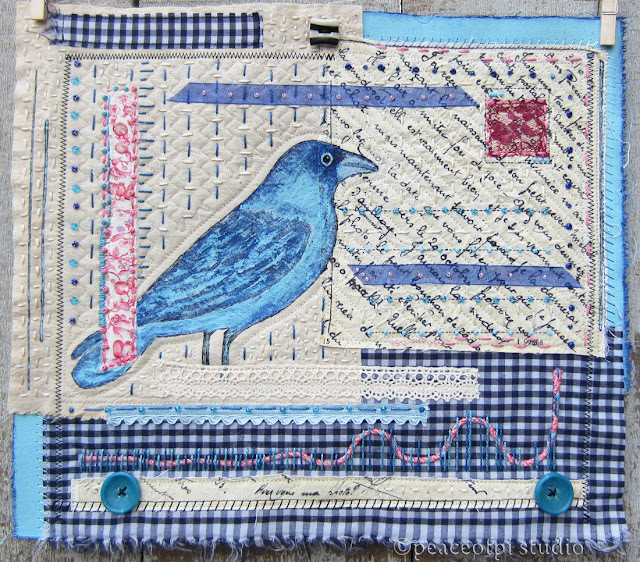 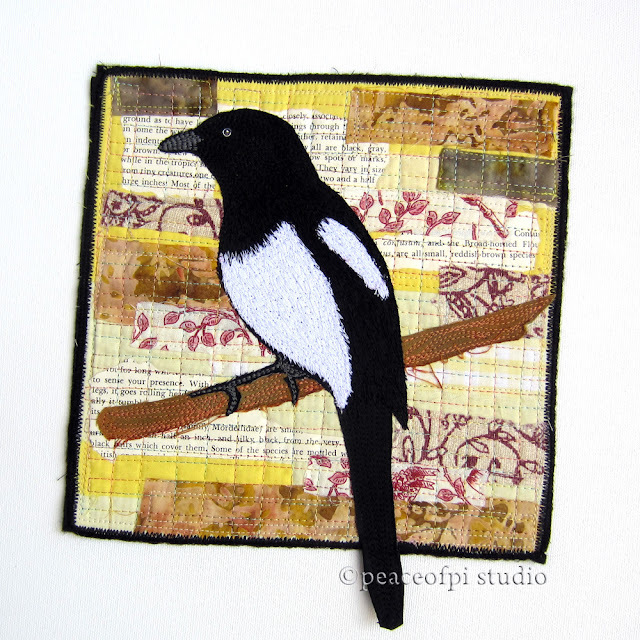 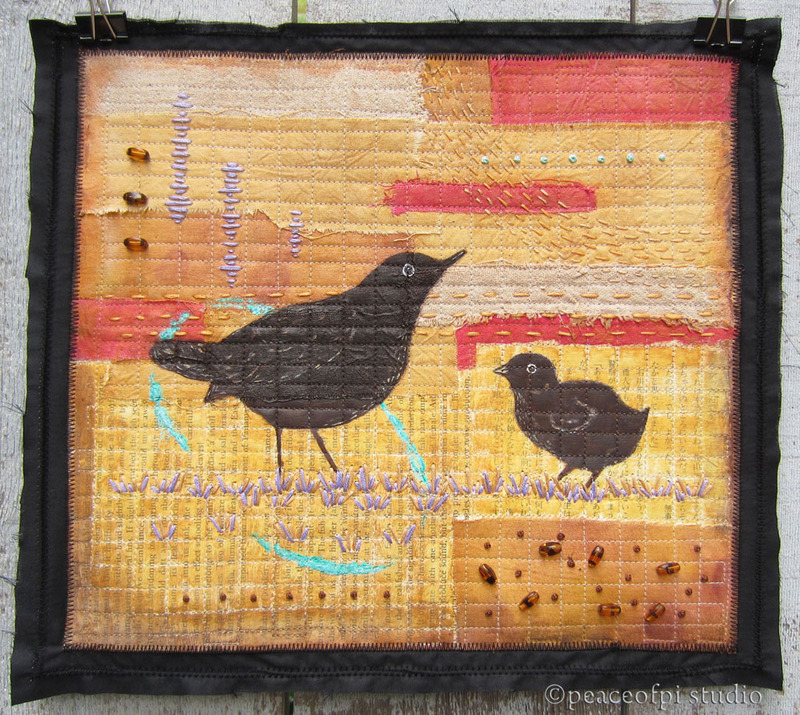 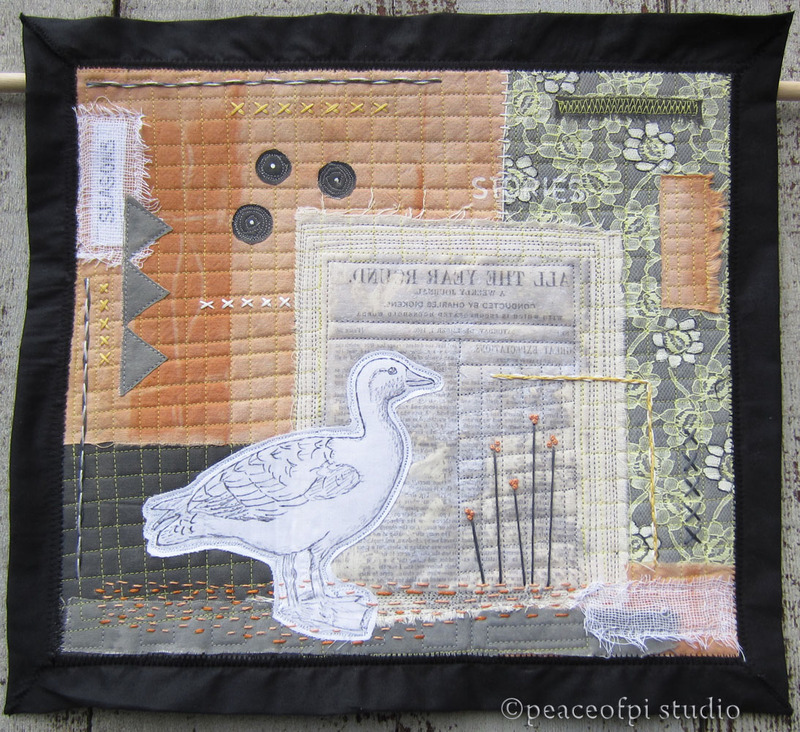 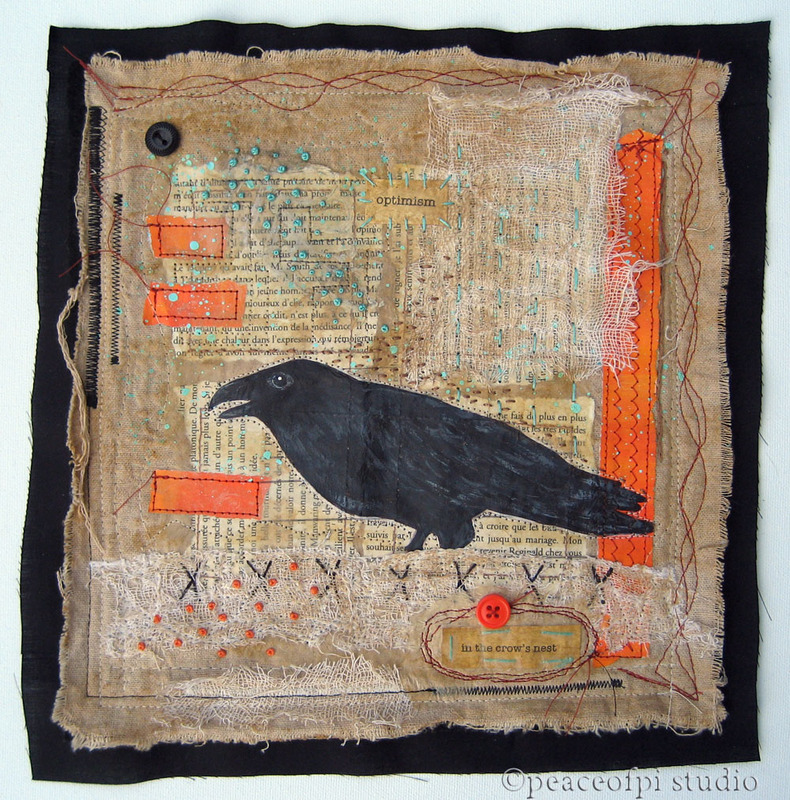 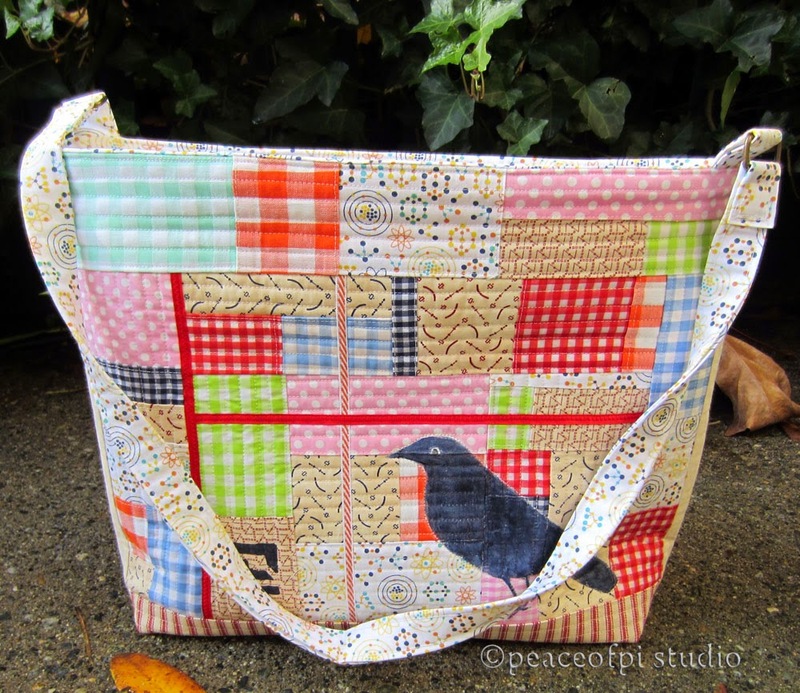 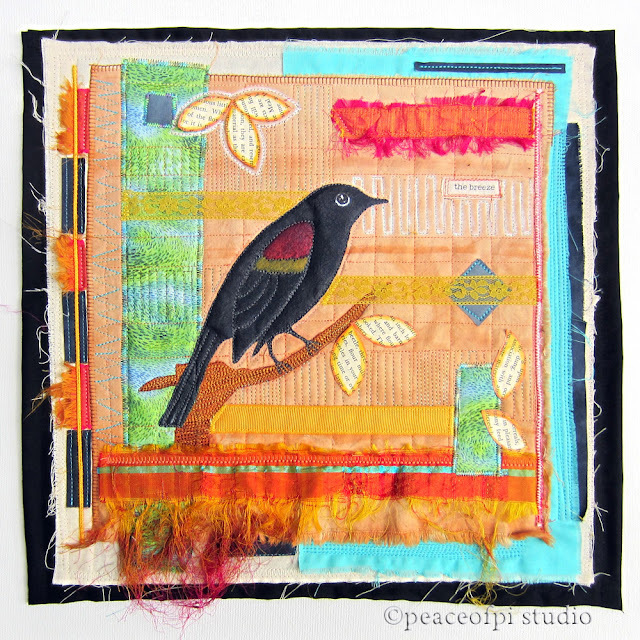 Blackbird Lessons, Mixed Media Art Quilt. 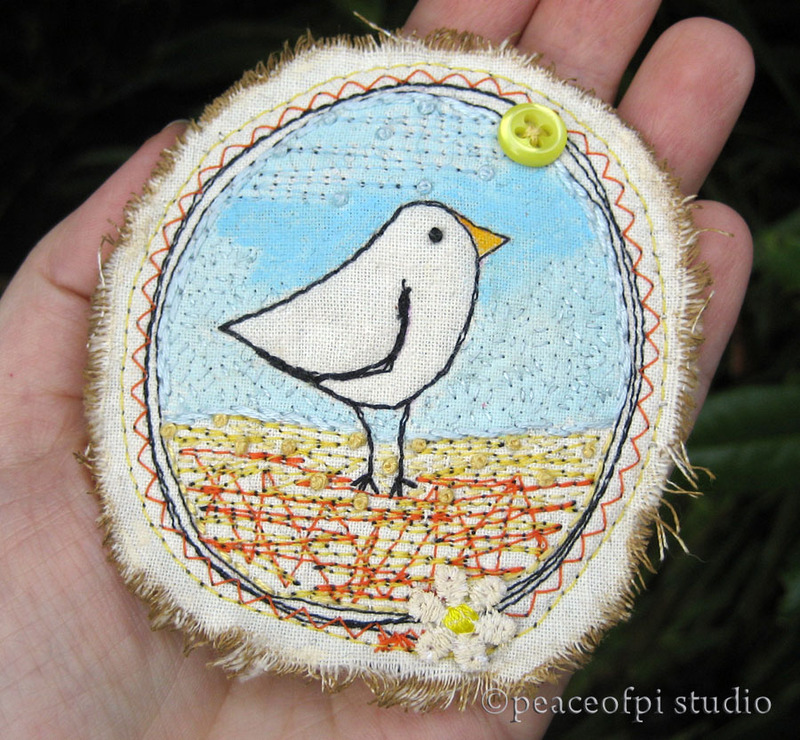 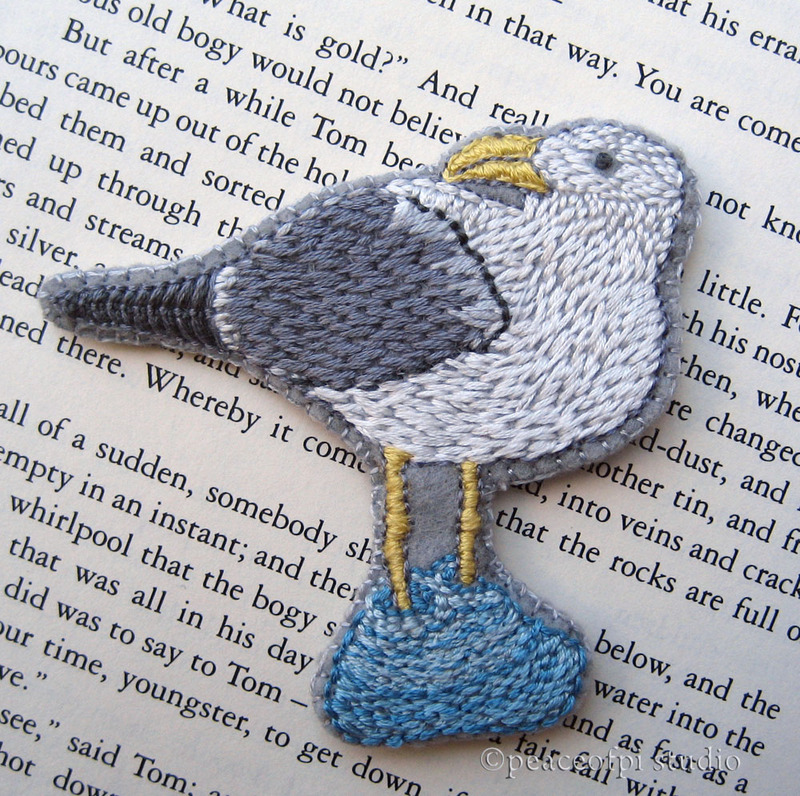 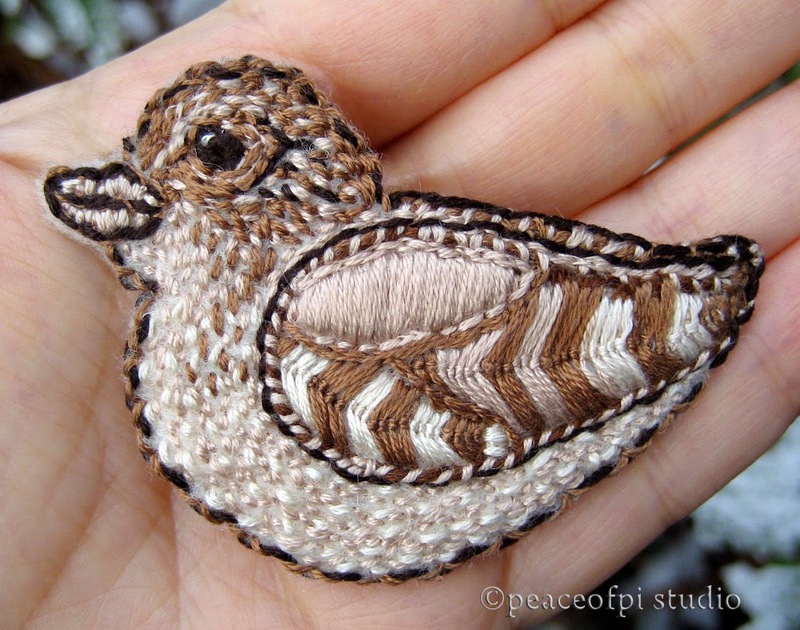 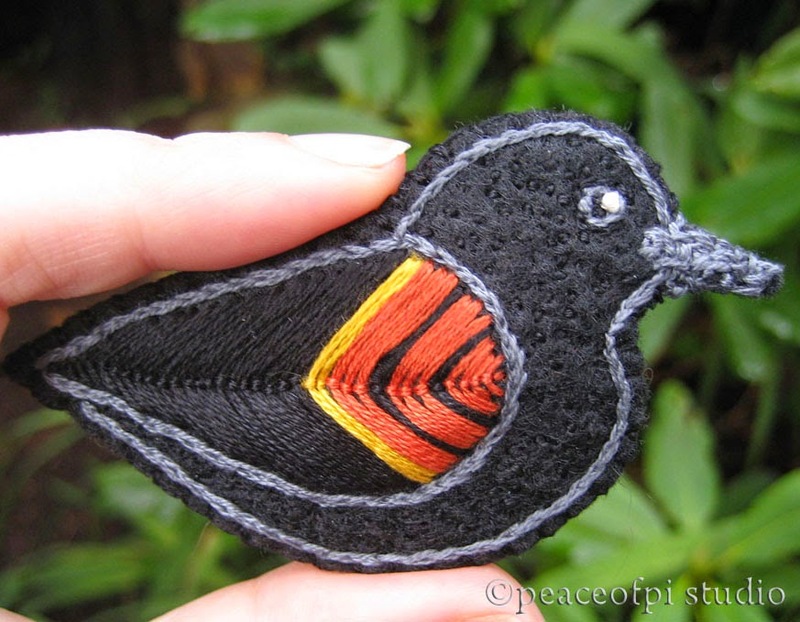 Bird Badge 3 X 3 1/3 inches. 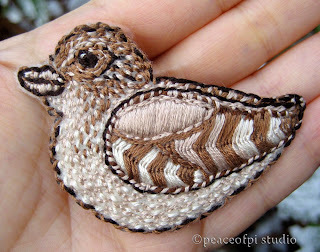 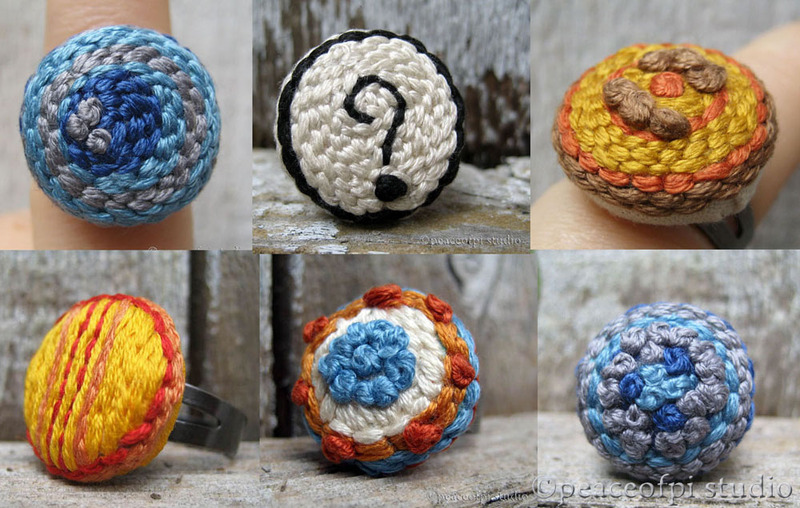 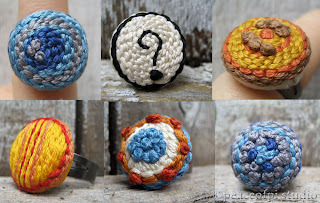 See many more brooches here. Morning Bird, Mixed Media. 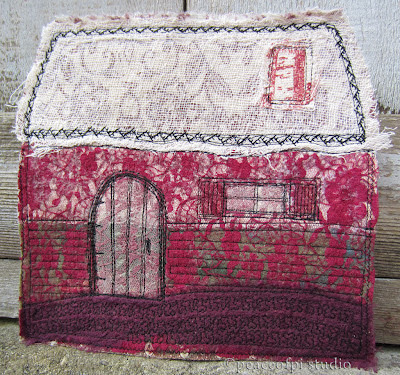 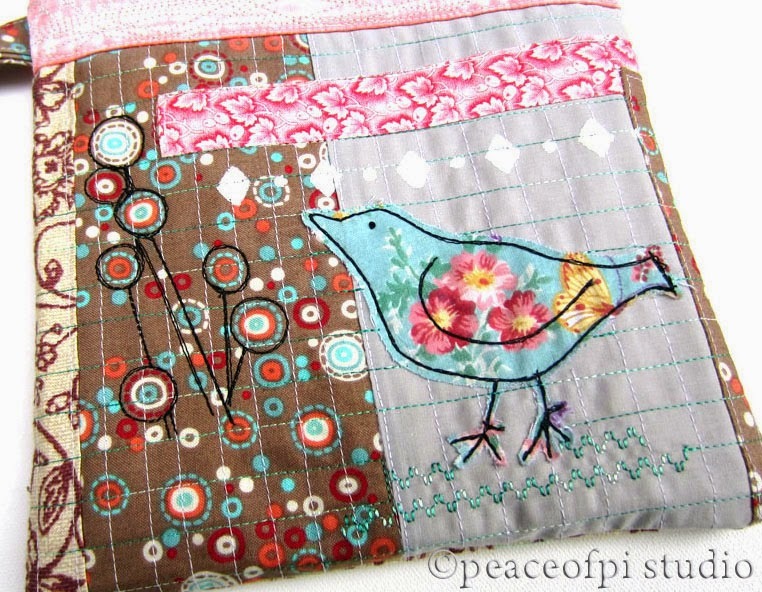 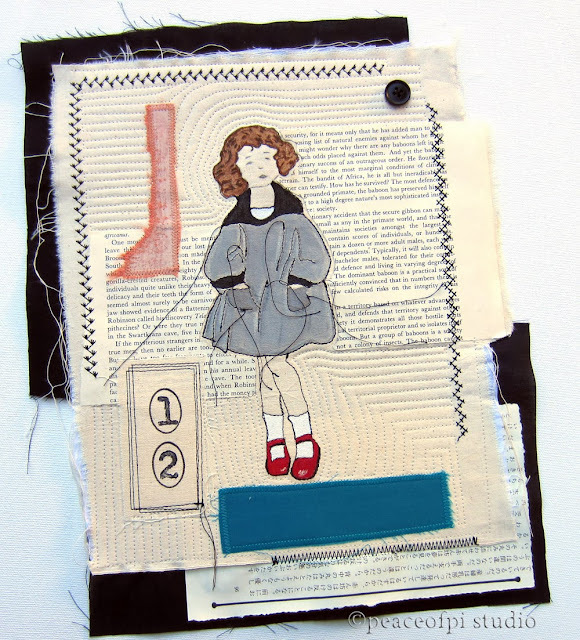 Fabric, paper, paint, machine stitch, hand embroidery. 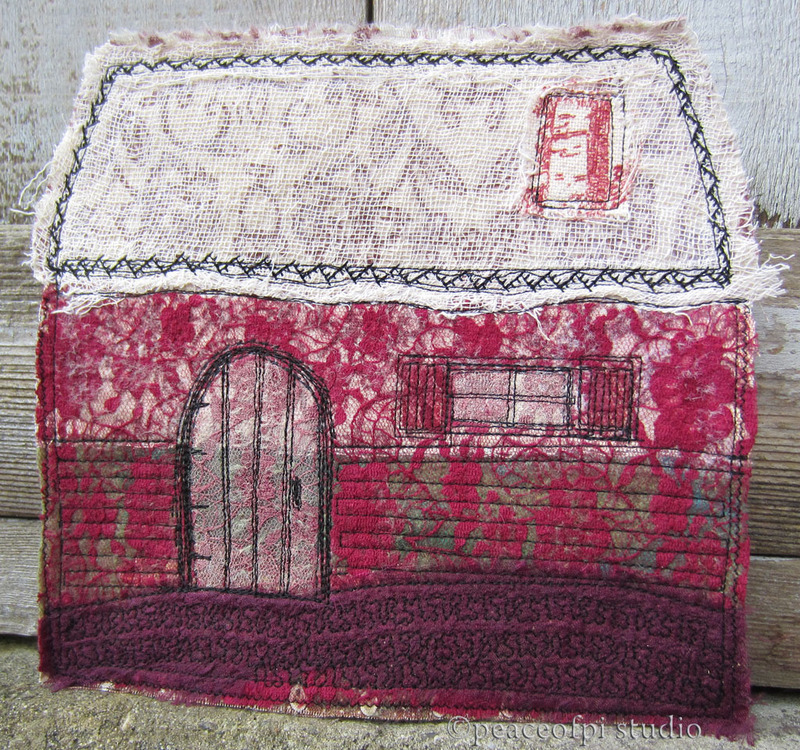 Cottage Miniature, 2 1/2 X 2 1/2 inches. Hand embroidery, needle felting. 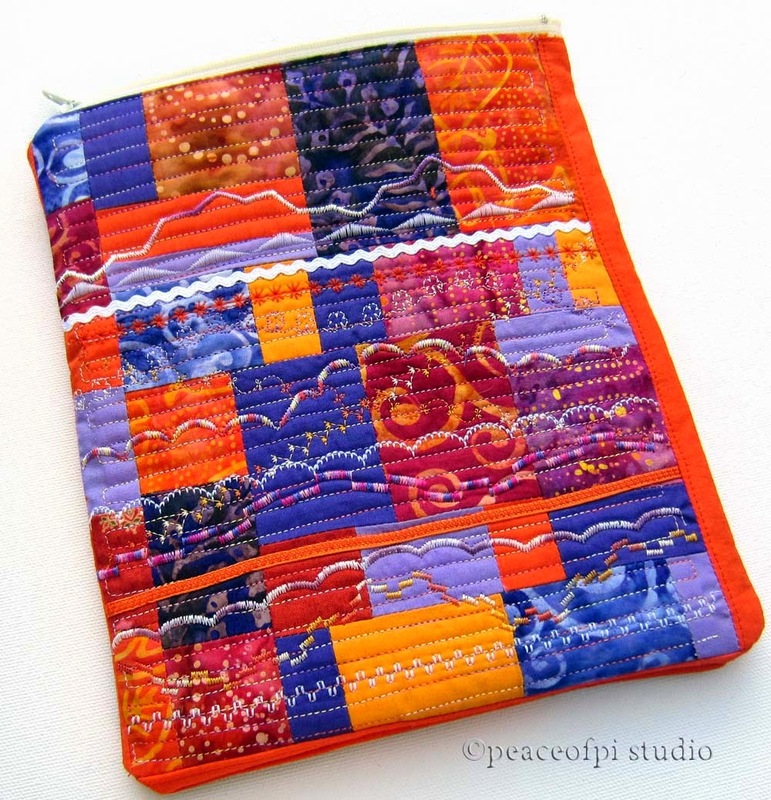 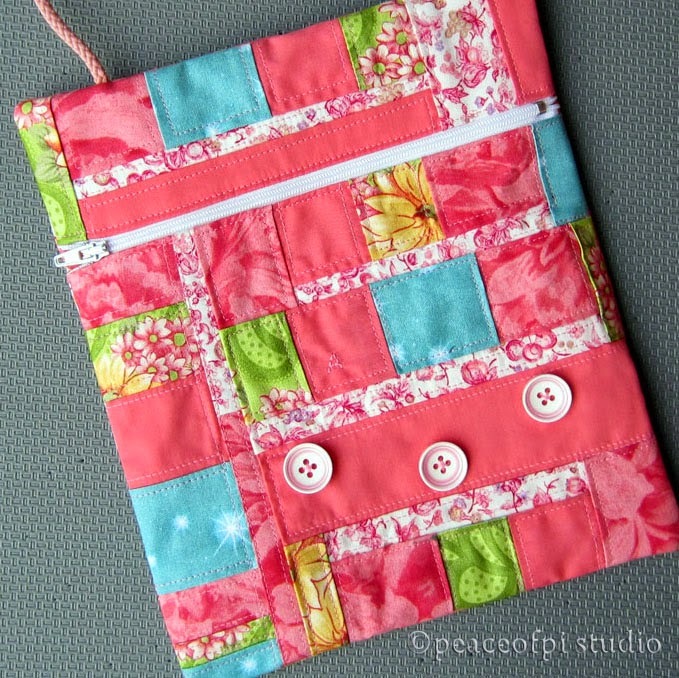 Thistle Mini Quilt, Needle Felting & Stitch (As seen in Art Quilting Studio magazine, Volume 5, Issue 2). 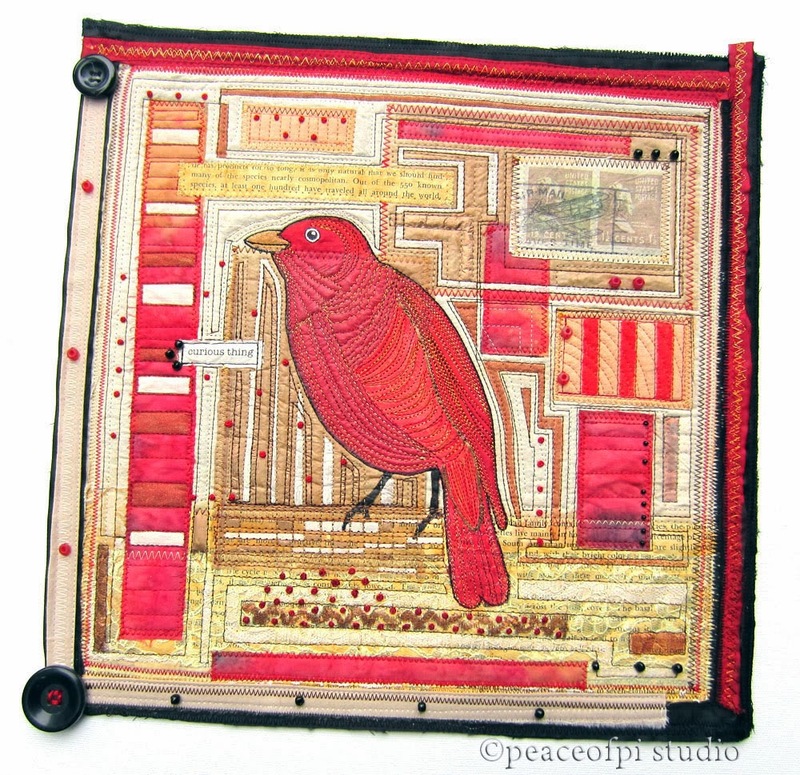 Expansive, Hand Embroidery & Machine Stitch. 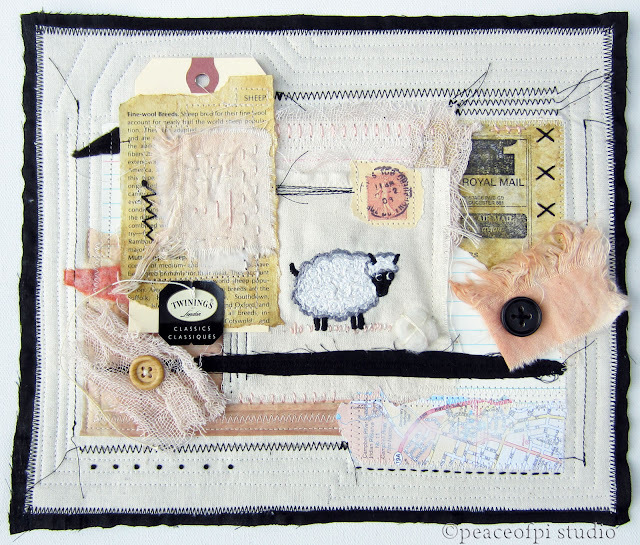 Sheep Stitched Collage, Mixed Media.